North Holland is one of the Netherlands' 12 provinces. It fits the nostalgic image that foreigners have of Holland. 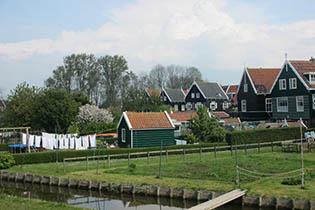 It’s a picture-postcard landscape of canals, wooden bridges, dikes and windmills. The geometrically ordered polder countryside is pleasant to the eye. It is flat and uncluttered so often you can see all the way to the horizon. Overhead, impressive cloudscapes make for interesting contrast with the order below. The delights of this region can easily be discovered by bike: charming historical towns with busy marinas, bustling beach resorts, art and cultural history museums and traditional local architecture. 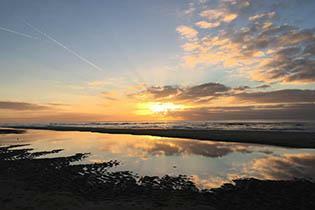 On the North Sea coast, cycle through windswept, undulating dunes which not only protect the hinterland from the sea but also harbour many species of dune flora and fauna. If you can, come in springtime when tulips, hyacinths and daffodils come into bloom and the bulb flower fields just behind the dunes are a sea of colour. We know you will have a great time exploring these truly Dutch landscapes. 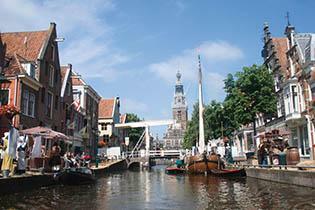 This tour takes you to you Holland's VOC towns along the coast of the former Zuiderzee. You also get to discover Amsterdam and the beautiful sandy beaches and dunes along the North Sea coast.